Michael Maness is an assistant professor in the Department of Civil and Environmental Engineering at the University of South Florida. He is also affiliated with the Center for Urban Transportation Research and a core member of the TOMNET Tier 1 University Transportation Center. Michael's research interests are in the methodology and application of behavioral modeling in ﻿urban and regional systems. Michael has published research in leading transportation journals on advanced choice models with applications to car ownership, managed lanes, cycling behavior, activity behavior, and communication behavior. His professional experience has included a postdoc at Oak Ridge National Laboratory and a graduate research fellowship at FHWA's Turner-Fairbank Highway Research Center. Michael was the 1st place recipient of the 2015 Eric Pas Dissertation Prize for his work on incorporating social interactions into activity and travel behavior models. He was also a ﻿2015 University Transportation Centers Outstanding Student of the Year, a two-time Eisenhower Transportation Fellow, and a former Bridge to the Doctorate Fellow. Data collection techniques for social and behavioral studies of travel behavior. My professional experience has spanned work involving the application of advanced (discrete) choice models as well as simulation and operations of smart systems. Additionally, I have unique expertise in the incorporation of social interactions in choice models. My current focus is on incorporating attitudes and social interactions in studies of transportation decision making. For selected examples of my work, see my Research page. H. Aziz, H. Park, A. Morton, R. Stewart, M. Hilliard, and M. Maness (2018). A High Resolution Agent-based Model to Support Walk-Bicycle Infrastructure Investment Decisions: A Case Study with New York City. Transportation Research Part C: Emerging Technologies, 86, 280-299. M. Maness (2017). Comparison of Position Generators and Name Generators as Social Capital Indicators in Predicting Activity Selection. Transportation Research Part A: Policy and Practice, 106, 374-395. C. Cirillo, Y. Liu, and M. Maness (2017). A Time-dependent Stated Preference Approach to Measuring Vehicle Type Preferences and Market Elasticity of Conventional and Green Vehicles. Transportation Research Part A: Policy and Practice, 100, 294-310. M. Maness, C. Cirillo, and E. Dugundji (2015). 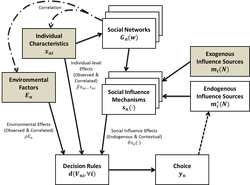 Generalized Behavioral Framework for Choice Models of Social Influence: Behavioral and Data Concerns in Travel Behavior. Journal of Transport Geography, Vol. 46, pp. 137-150. X. Jiang, Q. Gan, J. Bared, M. Maness, and D. Hale (2015). Traffic Performance Analysis of Dynamic Merge Control Using Micro-simulation. Transportation Research Record: Journal of the Transportation Research Board, Vol. 2484, pp. 23-30. My Google Scholar profile can be accessed at: scholar.google.com/citations?user=hD8t6LEAAAAJ. Understanding the determinants of activities and travel is critical for transportation policymakers, planners, and engineers to design and manage transportation systems. These systems, and their externalities, are interwoven with social systems in communities, cities, regions, and societies. But discrete choice models – the predominant modeling tool for researching travel behavior and planning transportation systems – are grounded in theories of individual decision-making. This dissertation expands knowledge about the incorporation of social interactions into activity-travel choice models in the areas of social capital and social network indicators; social influence motivations and informational conformity; and misspecification errors from social network data collection. Incorporating social capital into activity choice models involves using social capital indicators from surveys. Using a position generator question type, the role of social network occupational diversity in activity participation was explored and the performance of models using name generator and position generator data was compared. Access to the resources embedded in diverse networks was found to positively correlate with leisure activity participation. Compared to core network indicators from name generators, position generator indicators were typically better at predicting activity participation in a cross-validation study. Current models of social influence in travel do not account for varying motivations for social influence such as for accuracy, affiliation, and self-concept. To test for an accuracy motivation, a latent class discrete choice model was formulated that places individuals into classes based on information exposure. Contrasting with existing work, this model showed that “more informed” households are more likely to own bicycles due to preference changes causing less sensitivity to smaller home footprints and limited incomes. A Bayesian prediction procedure was used to derive distributions of local-level equilibria and social influence elasticity. The effect of errors in social network data collection using name and position generators is not fully understood for choice models. In a case study, the social network occupational diversity measure was robust to varying position generator lengths. Simulation experiments tested the implications of social network structure, misspecification, and small samples on social influence choice models where sample size, social influence strength, and degree of misspecification had the greatest impact.